Enjoy a head end ride on board a train of tank cars on the Indiana Rail Road from Indianapolis to just south of the settlement of Fruitdale. We have several cameras on board the locomotives, and you'll enjoy the ride from a variety of angles. The audio is just as interesting. We carefully placed microphones on the exterior of the units, and you'll enjoy great natural sound as your train roars alone (note, the is no sound from the interior of the locomotive cab). You'll enjoy the ride as we travel through urban Indianapolis, then flat farm country, and lastly as we start climbing through the hills of southern Indiana. This line has been called the "H-Dry" for the many bridges it crosses. The further out of Indianapolis we go, the more bridges we will see. The Indiana Rail Road is one of the more interesting regional railroads in the United States, and along the way you'll learn the history of the line and about current operations. A fantastic addition to any rail fan's library. Running time 111 minutes. In this volume you'll ride the train from just south of the settlement of Fruitdale to Switz City, Indiana. Enjoy riding through the most scenic section of the Indiana Rail Road, as the train climbs through the hills of southern Indiana. This line has been called the "Hi-Dry" for the many bridges that it crosses. In this program, you'll cross the 900 foot long Shuffle Creek Viaduct and the half mile long Richland Creek Viaduct, also called the Tulip Trestle. You'll also pass through Unionville Tunnel and go right through the campus of Indiana University. Enjoy a head-end ride aboard a mile and a half long train of coal empties on the Indiana Rail Road from Netwon, Illinois to Riverton, you'll ride the Illinois segment for this train from the power plant, to the Indiana border at the Wabash River. Don't be fooled that Illinois is flat. This is a very hilly section, and the railroad has one stretch of 3 percent grade!We have several cameras on board the locomotives, and you'll enjoy the ride from a variety of angles. 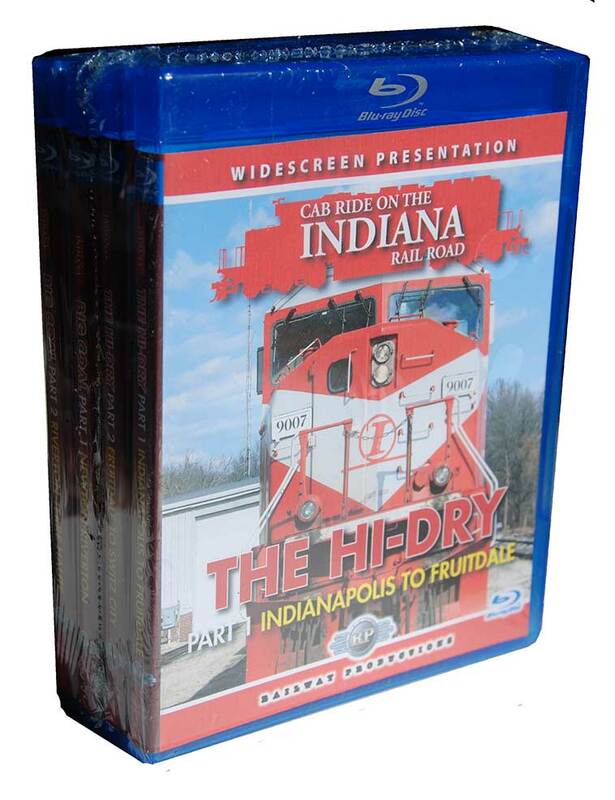 In this volume, you'll ride the Indiana portion of this train, from Riverton, Indiana (on the Wabash River border with Illinois) to Martin siding, just outside of Terre Haute. Enjoy the busiest part of the Indiana Rail Road with heavy welded rail and CTC. We have several cameras on board the locomotives, and you'll enjoy the ride from a variety of angles. The audio is just as interesting. We carefully placed microphones on the exterior of the units, and you'll enjoy great natural sound as your train roars alone (note, the is no sound from the interior of the locomotive cab). 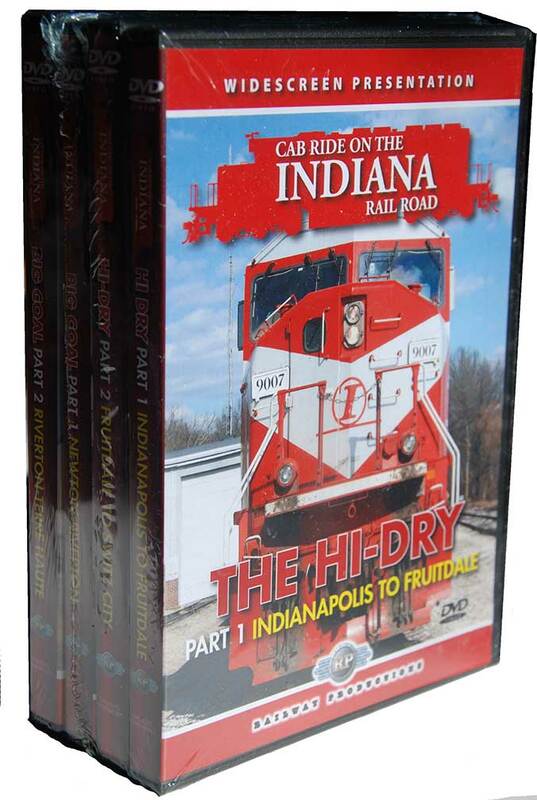 The Indiana Rail Road is one of the more interesting regional railroads in the United States, and along the way you'll learn the history of the line and about current operations. A fantastic addition to any rail fan's library. Running time 136 minutes. Contains chapter menus and the ability to turn the narration off or on. Award Value: 379 Points Earn points for free DVDs. Signup free. Nighthawk268 (La Grande Oregon) on 2015-01-14 20:13:54. Cab Rides are few and far between these days, even more rare to be in Blu-Ray quality. In this collection, you get hours of cab ride footage in beautiful HD quality. I love the Google maps that are presented showing you the whole line and where you are going. One feature I don't like which was a minor annoyance is when you pop the disk in, it auto plays soon after. (Sometimes the popcorn isn't ready yet) Anyways, cameras are on fixed positions and most of the time you have a straight ahead view. However the position of the front cameras change and give you a different perspective from time to time during the ride. In the first part of the program a camera issue had taken place and the missing areas of the ride where shot in a different season. You don't miss a mile, but the change to summer to make up for it was a beautiful color contrast to the colder season of before. From going through farmlands and through populated areas, the audio is really well done and it really feels like you are part of the ride when the horn blows for a crossing and climbing uphill. Though this isn't a class 1 railroad, you do board a Union Pacific AC4400 cab in the first part of the series. Then you board a SD90 for the second part of the series and get a beautiful view of the tulip trestle. One thing to note however is that you will not hear anything such as crew chatter or any audio from inside the cab. This seems to be the standard for cab ride videos post 9/11 era. You also don't see many other trains along the ride. I'm not going to lie, most videos of this nature usually put me to sleep at some point of the program.The constant sounds and views does the trick. I'll blame my age for that. There is a few periods on the ride where you are going at a pretty slow speed with some not so pretty bug spots on the windows. But hey, welcome to life on the railroad... and this isn't the Surfliner in terms of speed. All in all, this is a wonderful cab ride series. I couldn't imagine what this would look like with a 60 inch HDTV or bigger. The price may seem high, but if you do the math, as a bundle you are getting four videos. With the price of railroad videos standard around $30, it's worth it to me. I am not going to be to picky when it comes to cab ride videos now a days, I'm just happy to see new ones appear.